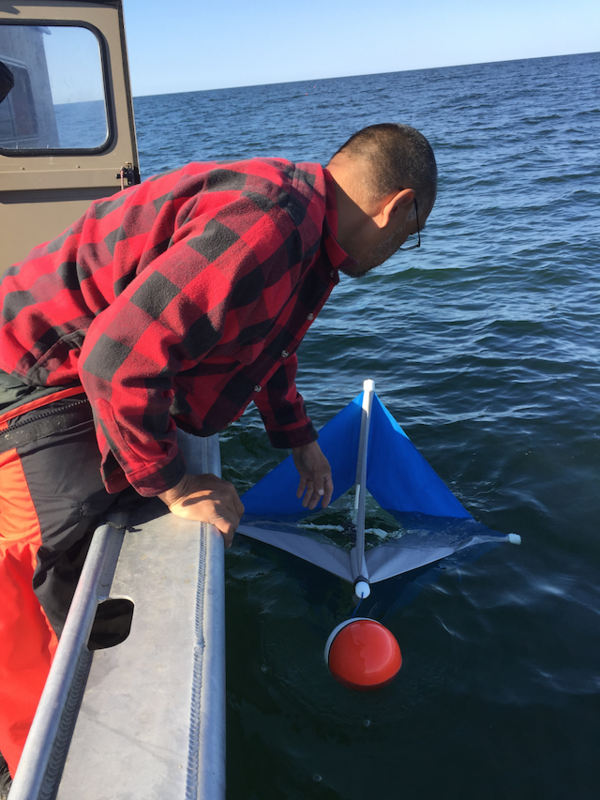 This project collects snapshots of near-surface circulation and water column structure in and near Kotzebue Sound using satellite-tracked drifters and a portable conductivity-temperature-depth profiler. The drifters provide information on circulation and the wind's and tide's effect in driving the local flow variations. Get the report or the study summary. Use the checkboxes to choose which deployments to display, or click the drifter's name to view the KML. Note display has 14 drifter limit. Ice extent is courtesy of the National Ice Center. In this map, a green thumbtack marks each drifter's deployment location, a blue thumbtack marks the current location, and a red dot marks the final location at the end of its deployment. Click these markers for more information about the drifter's status. Atmospheric conditions, sea ice, ocean circulation, and the temperature/salinity structure of Kotzebue Sound’s waters together define the physical habitat that supports the local biological production feeding Kotzebue Sound’s fishes, marine mammals, and other upper trophic level consumers, including humans. An ecosystem-level understanding requires appreciation for the magnitude and breadth of variability across trophic levels, a mechanistic understanding of the local and external factors that mediate environmental variations, and an understanding of the pathways through which the physical environment affects nutrient concentrations, phytoplankton blooms, and zooplankton distributions. Bird and marine mammal behaviors are influenced by prey locations and densities, which in turn depend on both grazing pressures and bottom-up forces. The project is implemented by Seth Danielson of the University of Alaska, Fairbanks and Alex Whiting of the Native Village of Kotzebue. Photo: Edward Ahyakak of Kotzebue deploys a drifter. Northwest Arctic Borough (NWAB ) and a cooperative research agreement with Shell Oil.